Ray Noland organizes an exhibition of art inspired by our ex-governor's recent exploits. Photograph: Jonathan Kinkley HAIR, THERE AND EVERYWHERE Why haven&rsquo;t the Graffiti Blasters caught up with him? As news of Rod Blagojevich’s federal indictment broke in late April, stenciled graffiti portraits of a fearful-looking Blago wearing his signature track suit appeared in Chicago alleys and underpasses, as well as a few more prominent locations, like the wall outside Wicker Park bar the Violet Hour. We thought the stencils were bleepin’ golden—a perfect blend of pop culture, public disdain for crooked Illinois politics and guerrilla street art. Three months later, they remain visible (and illegal) all over town. 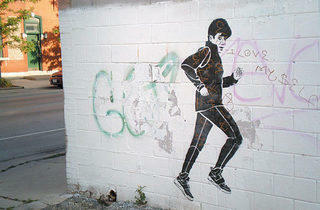 Is the city quietly tolerating the Blago stencils? “No,” says Chicago Department of Streets and Sanitation spokesman Matt Smith. Reached via e-mail, Smith claims many of the Blago stencils have been removed—and those that haven’t probably “have not been phoned into 311, are pending removal or have been removed by us and reapplied by the vandals.” He says the city has removed an astonishing 91,866 graffiti this year alone, which means the Graffiti Blasters are on track to exceed their 2008 total. 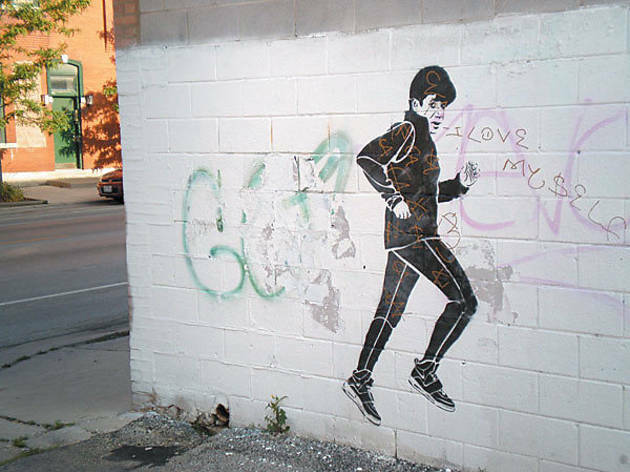 From Friday 24–Sunday 26, Noland’s Creative Rescue Organization hosts a juried exhibition of Blagojevich-themed art, “Run Blago Run!,” at 1925 North Milwaukee Avenue. Participating artists include Noland, photographer Amanda Rivkin and local muralist Jeff Zimmerman. Ten percent of the show’s proceeds will be donated to Street-Level Youth Media, a West Town nonprofit that teaches young people video and audio production, Web design and other creative skills. “Run Blago Run!” opens Friday 24, 6–9pm, at 1925 North Milwaukee Avenue.